Just minutes from the city, faint tire tracks blow away in the wind, and the vast expanse of sand quickly becomes disorienting. The sprawling desert north of Agadez, in the west African nation of Niger, is the size of France — and the search is on for a single stranded truck. We’re lucky; our military convoy is armed and equipped with GPS, along with rough coordinates of which way to head. But as night falls and we begin to burn through our petrol reserves revving through the deep sand, uncertainty spreads. Somewhere out there is a group of terrified migrants, lost in the desert for days, fearing that their hopes for a better future far away from here will end amid the dark and shifting sands that surround them. Best (CNN is withholding her last name for her protection) knows only too well what the migrants we are looking for are going through. She was one of the few to make it out of a similar truck alive, surviving for 24 days in the desert. Around her, the other passengers died, one by one, as they waited weeks for rescuers to arrive. “The first day, two guys died because of the hot sun. The third day was when people were giving up,” says Best. “We were economizing ourselves,” she explains. “We put a little water, just to taste it on the tongue, not to get dried up,” she says. Of the 27 people who boarded the truck, just three survived. Best had been lured away from her home in Nigeria by the promise of a better life in Germany. The smugglers told her they had found her a job as a hairdresser; she just had to cross the desert into Libya, where she could get on a boat to Europe. “They said it was just a one week journey. I spent more than one month and I didn’t get to Libya,” she says. When she arrived in Niger, she began to understand the scale of the smugglers’ deceit. “I was crying on the phone, she never told me that I was going there to prostitute,” she says. When Best resisted, she says the trafficker threatened her and stopped her from using the phone. “I just thank God that I did not get to Libya, because if I got to Libya I don’t know how my life would have been,” says Best. Libya is now a “black hole,” says Guiseppe Loprete, the Niger Chief of Mission for the International Organization for Migration (IOM). The country’s lawlessness, once an advantage to migrants, has become a threat as increasingly sophisticated criminal organizations and armed groups profit from the smuggling trade. Best is now at an IOM transit center in Agadez, waiting to return to the uncertain life she left behind in Nigeria. She’s one of the lucky ones. No one knows just how many migrants are perishing in the desert, but Col. Aboubacar Oumarou, commander of Niger’s Armed Forces in Agadez, says rescues by his men are becoming more and more routine. According to the IOM, 600 lives have been saved since April in newly-launched joint operations between it and the military. “The more pressure we put around the migrant routes used by smugglers, the more they divert from the usual roads and more to ones that are riskier with a lot of risk of breakdowns, accidents, and getting lost in the desert,” says Oumarou. 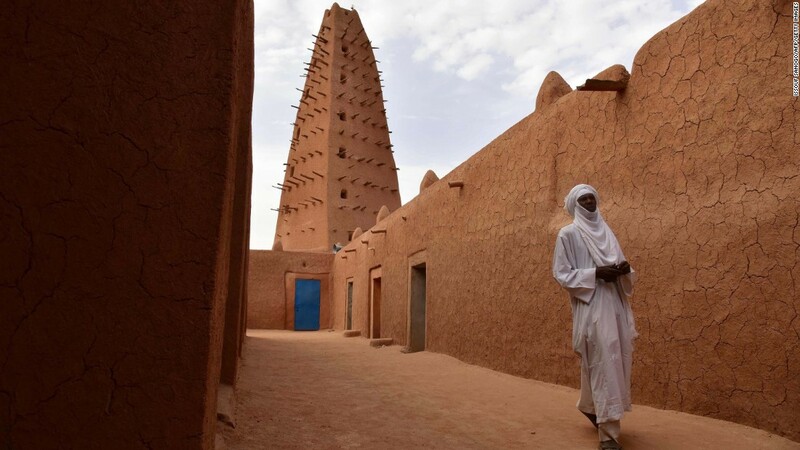 For centuries, the ancient city of Agadez — a World Heritage site whose historic buildings are constructed from red earth — has profited from its role as a transit hub at the southern edge of the Sahara Desert. In recent years, Agadez’s main cargo has been human: hundreds of thousands of migrants from West Africa, loaded into the back of pickup trucks for the arduous journey on towards Libya — and Europe. But late last year, the government of Niger began cracking down on the trade, giving in to pressure from the European Union, in exchange for a hefty package of aid money. The EU’s aim was clear: to stem the flow of migrants before it could reach Europe’s shores. With few other ways to get by, the clampdown has left smugglers like Abalde Aboubakar desperate to make ends meet. Aboubakar apologizes for the swarm of flies, brushing off a rug and offering up a place to sit in his cramped lean-to, as goats graze among the discarded plastic bags and trash on the public dumping ground next door. He says he’s no criminal, just a businessman — a travel agent of sorts — providing a service to the five young men who temporarily call this place home. “All the people that come here, they want to go to Italy,” he says. The migrants entrust their hopes and dreams — and their families’ life savings — to him, and for a fee, he arranges their travel onward. But his once thriving business is now struggling. “Today we have no food, because we have no money,” he says. Aboubakar says that with few other alternatives open to them, he and other smugglers have taken their business underground — and they are angry at the added costs of hiding their trade. 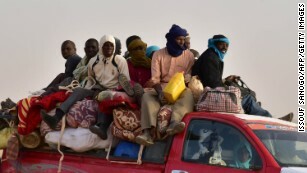 Agadez is becoming a tinderbox, packed with migrants willing to risk everything, those who have spent all they had and failed to make it to Europe, and an unemployed local population, that is rapidly running out of patience. “It’s all around us,” says Zara Ibrahim, a women’s leader and a mother. “What’s happening in Mali, what’s happening in Libya, next to us in Nigeria.” She worries that, without jobs, Agadez’s young people will look outward. Niger sits in the middle of what the US military refers to as a ring of insecurity. “This is a nexus area, kind of a focus area, for multiple threats to the US. Libya to the north, AQIM to the west or Boko Haram to the south,” says US Air Force Col. John Meiter, US commander of Air Base 101 in Niger’s capital, Niamey. Now the US military is moving its drone operation from Niger’s capital, Niamey, to Agadez. From 2018, at the behest of Niger’s government, US Africa Command (AFRICOM) will launch its MQ9 Reapers — “hunter/killer” drones with advanced intelligence gathering capabilities — from Air Base 201, just outside the city. For now, the new base is very much a work in progress. Massive construction equipment does battle with the desert landscape 24 hours a day, every day, building a runway capable of handling military aircraft. A few hundred support staff oversee the construction work from tents nearby. The $100 million project is a massive undertaking — the RED HORSE Engineering Squadron, in charge of the heavy lifting at Agadez, says it is the largest US Air Force-led construction project of all time. And while the instability around Niger will be the focus of operations, it will be the security situation in Agadez that ultimately determines the success of Air Base 201. A US Army civil affairs team is already trying to reach out to the local population. At one school, two officers teach dental hygiene to a local women’s group. It is a small gesture — an excuse to engage with the people here. Back in the dark nothingness of the desert, ten hours after we left Agadez, the convoy continues to struggle, tires sinking into the soft sand. Out here, with no sense of what lies before us in any direction, it’s clear why Niger’s government values the US aerial presence so highly. It’s also all too apparent just how terrifying the journey must be for migrants. In the distance, up ahead, lights flicker. The group from the lost truck — about 30 people in all, most from Nigeria, and around half of them women, wearing the local Islamic headdress to help them blend in — are huddled around an abandoned well. Stranded out here for three days, abandoned by their smuggler after his truck broke down, they say they had no idea how dangerous these desert tracks could be. They were sold a dream on Facebook, they explain. Like Best before them, they’ve fallen for a scam which aims to get them to Europe and force them into prostitution. The migrants plead with the soldiers to take them onwards to Libya and not back where they came from. Agadez remains a transit point for people’s hopes, dreams and, increasingly, of their despair.